The town Saint-Imier is located in the Jura mountain valley. 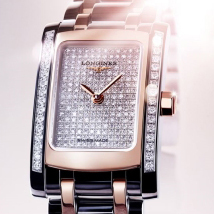 Since the appearance of the watch company Longines, the city has become a regional center of the watch production. Saint-Imier is a whole new collection of watches, inspired by the model of 1945. Currently the collection Saint-Imier includes four various models, including women's watch with pearl dial and date aperture at position 3 o’clock. Other watches Saint-Imier have 39-millimeter stainless steel case complete with a welt, button of chronograph and the crown, which are made of pink gold. The hands and hour markers are also made of pink gold. Automatic watch movement ETA L688, designed specifically for Longines, is set in the case. This movement can be seen trough the transparent case back. Power reserve is 54 hours. The date aperture is located at the position between 4 and 5 o’clock. 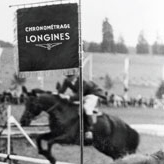 The chronograph counters are located at position 9, 6 and 3 o’clock. These watches are available on a steel bracelet with two rows of gold links on the center. There is also an analogue of the described above chronograph, but entirely made of steel and with black dial. In this new collection a special place is occupied by new men’s watch with four retrograde complications, moon phase indicator at the position 6 o’clock, as well as day and night window in the shape of the eye under the mark 12.